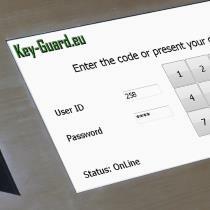 Keyguard - innovative solution for storage and authorized keys issuance. 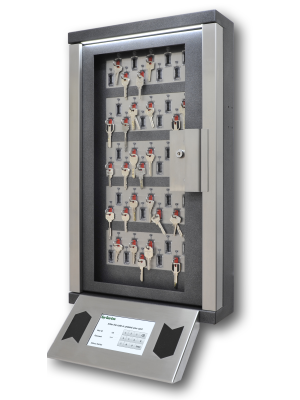 The KeyGuard key management system has a sophisticated design that allows you to save more than three times as much space for wall mounting. Only authorized users with individually assigned access rights have access to the key. 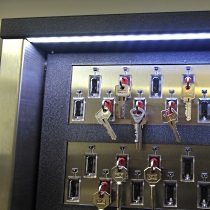 The time needed to give a key significantly reduced, thanks to LED backlighting of the key storage cells. The keys are carried with intellectual key fobs with a built-in chip, provided with unique identifier and a 3mm stainless steel clamp. The chip data are used for key check and identification each time when you have to get a key from the storage or to put it back. Key fobs in different colours may be ordered separately. A big touch-sensitive display allows not only to operate the key control system easily, but also to quickly obtain any information you may be interested in, e.g. who has taken a key and when or in which key box at the object this key is now. You also can create and print reports of any kind with the help of a software included in the scope of supply. Everything for the convenience of the user.Attention to details. 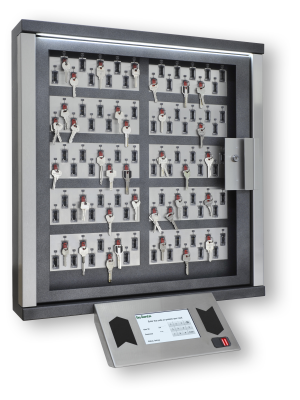 The KeyGuard key management system has a sophisticated design that allows you to save more than three times as much space for wall mounting. Only authorized users with individually assigned access rights have access to the key. 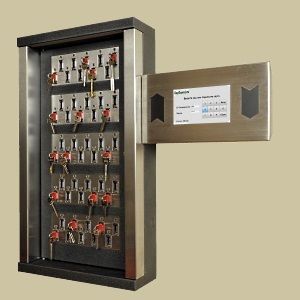 The time needed to give a key significantly reduces thanks to LED backlighting of the key storage cells. The physical appearance of a housing with a minimum depth allows a system to harmonically fit into the interior of a modern office, and the key control system is provided with enhanced possibilities of control and is easy to use. The system may also be supplied with a solid metal door, transparent and made of polycarbonate, or even without a door. The control panel may be fixed either at the lower part of the housing, or on the right side. Two brackets are also included with the shipped unit. Storage security. Small details are also important. The keys are carried with intellectual key fobs with a built-in chip provided with a unique identifier and a 3mm stainless steel clamp. The chip data are used for key check and identification each time when you have to get a key from the storage or to put it back. Key fobs in different colours may be ordered. 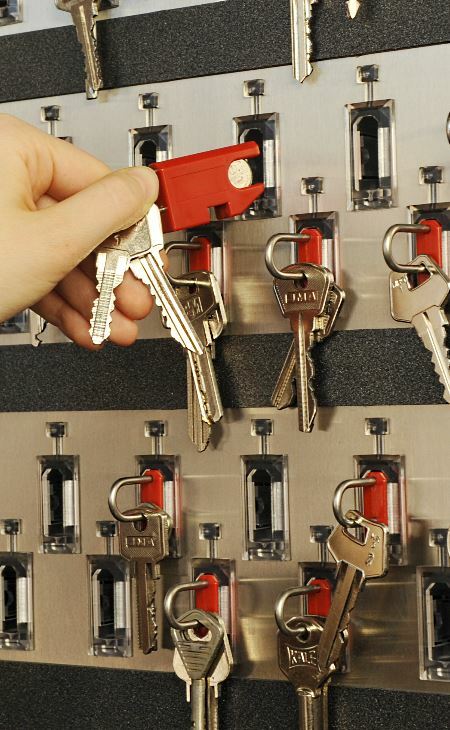 Key holder cases may be used in order to increase security. 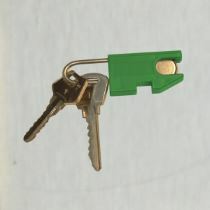 In this case, keys are also carried with intellectual key fobs with a unique identifier, and then a key with a key fob is put into a holder case that may be sealed in a standard way. Standard key holder cases (70mm) and elongated key holder cases with a length up to 105 mm (length from the centre of the opening to the pointed end of the key) can be supplied. Scope of application: large-scale enterprises, business centres, multi-functional complexes, governmental facilities, sport and leisure centres, educational institutions, motor transport enterprises, casinos and gaming industry, dispatcher's offices, hotels and recreation facilities, and other locations. Easy to operate, easy to scale. Integration is important. Two readers (take/return) of the Wiegand format and the MorphoSmart finger print scanner from the worldwide biometric technology leader, French company 'Safran', are integrated in the display housing. 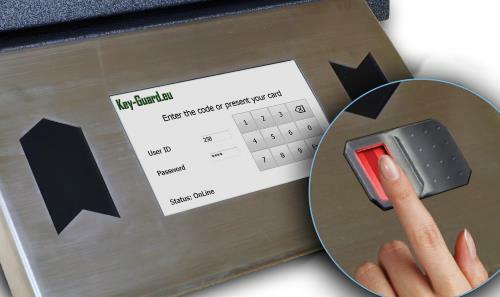 The system enables access to the keys with an access card and/or finger print without need to enter additional information. If a key management system is integrated with a security alarm system, messages sent by the security alarm system, e.g. security status of the object and area setting/enabling confirmation, can be displayed online. 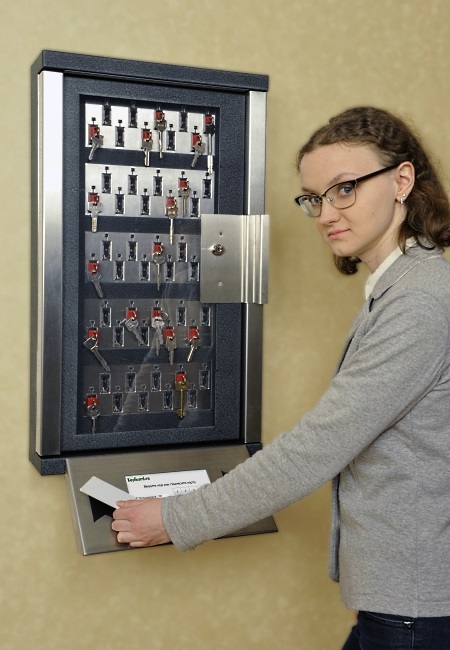 The electronic KeyGuard key holder has been developed with a possibility to interact with security systems installed at the object. It is especially important that an interaction protocol is opened for integration partners - this allows to provide connection between the systems on every level. 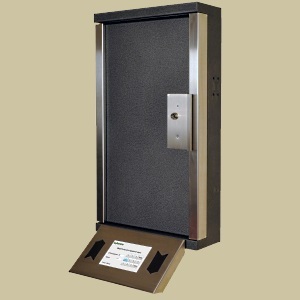 For instance, if an electronic key storage system is integrated with a security alarm system, the security control system is enabled/disabled fully automatically, when the key is returned/given out. An appropriate confirmation can be displayed on the screen of the key control system. The system has a modular structure. You can order a system of any size starting with 10 keys and later enhance it up to several hundred keys. You can operate the system both locally, using the keyboard, and remotely, via the computer network, irrespectively of the amount and the size of the keys stored in the electronic key holders. 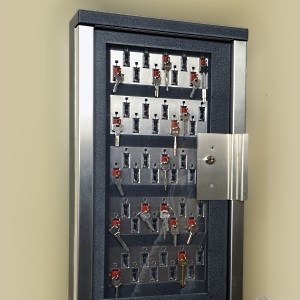 A unified software allows to control, via network connection, both a simple storage system including only one KeyGuard electronic key holder and a system including several KeyGuard key storage systems located in different parts of a building or even at different geographically separated objects. 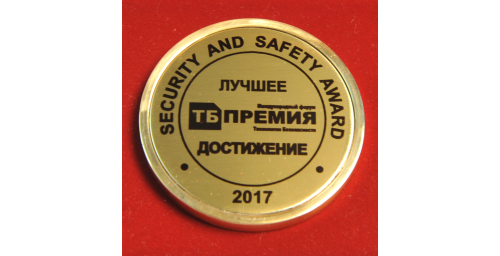 In each case, irrespectively of the system structure you chose, you will familiarize yourself with our advanced technologies and a special software, both combining security in use and convenience in operating. We supply ex stock, in two colours: dark silver 5359AO445 and light RAL7038. We also manufacture, upon request, electronic key holders in colours according to your specification.